Our deep thinking, innovative research, and smart communications make us market leaders and without hesitation, we are sought out by clients to help them understand their place in the world. Where old meets new and complex models inform simple solutions. Where our experience in business is reflected in mature thinking whilst our mindset remains fresh and agile. 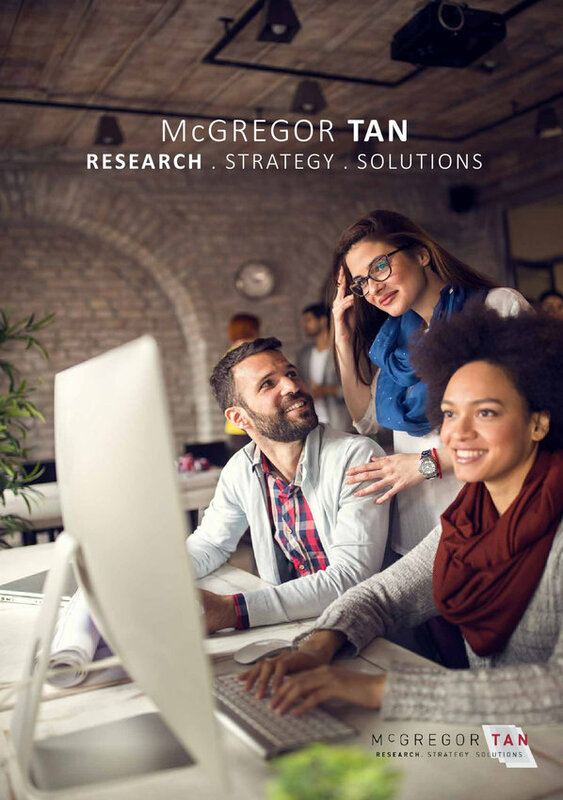 Established in 1976, McGregor Tan is one of Australia’s most experienced full-service social and market research agencies. As Adelaide’s first, home-grown market research company, we have expanded to operate in all capital cities and regional areas across the country. Our growth is attributed to visionary researchers who combine new and innovative ideas to offer deep insights, actionable solutions and smart communications to our clients. We have become trusted research partners to our clients and are proud to associate their success with the insights we have generated. McGregor Tan houses centralised CATI facilities in a fully supervised Adelaide based location which services the entire country with complete quality control, that is built into each stage of fieldwork and data processing. Our focus group room facilities offer the only one-way glass viewing rooms in South Australia, allowing clients to see reactions, body language and product interaction of focus group participants first hand. We are unique in that we work directly with end clients as well as other research companies who make use of our national recruitment services, qualitative and quantitative research services and focus group rooms and facilities. We pride ourselves on delivering excellence in everything we do for our clients and as such we are accredited to the highest professional industry standards (CIRQ ISO 20252) for the full scope of research and strategy services. This includes customised research for consumers, social and commercial studies, which are recognized by the Australian Market and Social Research Society. We are active participants in the research industry by maintaining longstanding memberships with national peak bodies AMSRS and AMSRO and support local business communities through memberships with Brand SA. Tom possesses a highly sought after mix of specialised strategic marketing skills complimented by commercial expertise in market research, sales and business development. It is this combination that gives Tom the ability to understand the needs of public and private sectors, the political challenges faced by Government agencies and Commissions, as well as appreciate the commercial reality of business. For almost 10 years, Tom worked as a buyer and commissioner of research for the public sector following which he became Managing Director of McGregor Tan. He brought to the business a fresh approach to market research based on innovative research techniques, smart communication, visual representation and actionable commercial insights. Jaclyn is an experienced focus group facilitator with a passion for marketing and communications. She is highly skilled in deploying techniques designed to elicit honest, engaging and exploratory insights from focus group participants. With a knack for destination development activities and strategic planning, Jaclyn has spent more than 15 years working in the tourism and economic development sectors in South Australia and Northern Territory. During this time she has held a number of Board positions at a state and national level, advising in these areas. Her greatest skills are in client liaison, stakeholder relationships, economic development activities and communications. Jaclyn provides high level direction and management of all strategic company activities at McGregor Tan. David has worked in the market research industry and with McGregor Tan for more than a decade. He has a wealth of market research knowledge and experience across almost every industry and sector. David is passionate about ‘joining the dots’ using data from market research and finding actionable solutions to clients' research and business problems. He also has a background in marketing, strategic planning and operational management within Government and non-Government business sectors in Australia and South East Asia. His knowledge and experience include industrial marketing, product and organisational branding, website development and computer software engineering. David completed his studies at the University of Adelaide, where he was a recipient of the Rational Prize for Software Engineering. Consultant Advisor and a founding partner of the original company, Zing Hai provides strategic input into research projects as needed using his profound understanding of market research and his experience with clients in a wide range of industries. Zing Hai was educated at Prince Alfred College (Tennyson Medallist) and Adelaide University (Masters in Urban and Regional Planning). He is an inaugural graduate of the QPMR (Qualified Practising Market Researcher) program. Susan joined McGregor Tan in the 1980’s and has played a significant role in developing many of the procedures that form the basis of McGregor Tan’s quality management systems today. Susan manages a team of researchers and is responsible for all aspects of data management. She has profound knowledge of market research methods and a passion for finding solutions that are tailored to clients’ needs. Susan also manages McGregor Tan’s extensive online panel. Elena is an integral part of the qualitative research team. She supports the general manager in coordinating qualitative research projects, including focus group facilitation, room hire and catering. Her responsibilities include the writing of recruitment memos and screening surveys, transcribing focus groups and preparing reports of qualitative research findings. Luc manages McGregor Tan's IT infrastructure, including day to day maintenance, IT support, server maintenance and telephone systems. Luc looks after the database management function of McGregor Tan's extensive respondent database, one of the first and strongest research panels in South Australia, and manages the company's audio-visual capabilities. Luc is also McGregor Tan’s Tableau expert and passionate about extracting intelligence and insights from data obtained through market research and presenting it in a smart and interactive way. Julia looks after McGregor Tan’s accounting function, including invoicing and recovery of receivables, and supports the Marketing and Corporate Services manager in performing corporate services duties. Vincent joined the McGregor Tan team in 1993. Having more than 2 decades of experience, Vincent is a specialist in qualitative and diagnostic research. He is an experienced executive interviewer and highly skilled in utilising techniques designed to engage focus group participants and elicit honest and exploratory insights. Prior to joining McGregor Tan, Vincent worked in arts, education and tourism. He was previously Marketing Manager of the Adelaide Festival Centre. Vincent completed his degree in education at the University of London. With more than a decade’s experience at McGregor Tan, Stephanie is an integral member of the data management team. She provides research support and quality control at all stages of the market research project, from data collection and data processing to documentation of outputs. Her responsibilities include graphing, preparing base data reports for analysis and supporting the Research Officer in delivering market research projects. Chris has been with McGregor Tan for more than 15 years. She has a deep understanding of market research methods and works closely with the Client Services and Operations Manager to deliver market research projects. Her responsibilities include data processing, data collection management, production of statistical tables, graphing, writing of questionnaires, analysing data, preparing base data reports for analysis and report writing. Terri has been with McGregor Tan for more than a decade and is responsible for recruitment of focus group participants, nationwide. She is an expert in focus group recruitment and participant screening, ensuring that all participants meet clients’ brief specifications. Always looking for innovative ways to recruit participants, the recruitment team specialises in recruiting participants in hard to reach and regional areas and pride themselves in achieving on average a 90% focus group attendance rate. Toni manages the McGregor Tan recruitment team, who are responsible for recruitment of focus group participants, nationwide. Having been part of the McGregor Tan team for more than 3 decades, Toni has extensive knowledge and experience in recruiting focus group participants. Always looking for innovative recruitment techniques, Toni and her team specialise in recruiting participants in hard to reach and regional areas and pride themselves in achieving on average a 90% focus group attendance rate. Toni is an expert in participant screening, ensuring that all participants meet clients’ brief specifications. Anna has been part of the McGregor Tan team for more than a decade. She is responsible for recruitment of focus group participants, nationwide. An expert in participant screening, Anna is a highly skilled and experienced recruiter of focus group participants. Always looking for innovative ways to recruit participants, the recruitment team specialises in recruiting participants in hard to reach and regional areas and pride themselves in achieving on average a 90% focus group attendance rate. Having a background in office management and hospitality, Deana is responsible for McGregor Tan’s room hire function. Liaising on a daily basis with clients and the recruitment team she ensures the smooth running of related operations. Her responsibilities also include recruitment of participants for focus groups and in-depth interviews, nationwide. Deana has a background in CATI, market research fieldwork, face-to-face interviewing and accounts. Over a period of more than 40 years we have helped 10,000+ clients understand their place in the word. Meet some of them.